In his recent book chapter Rethinking Repair (2014), Jackson issues an important reminder for technology scholars: to focus not only on the development of the new, but on the many and myriad ways that we live with and sustain technologies of all kinds. He calls for a renewed interested in ‘broken world thinking’ – where disintegration, breakdown and decay become important starting points for understanding the nature of socio-technical change. Beginning just at the point where relationships and materialities are unravelling, invites a very different set of questions on the nature of socio-technical worlds. 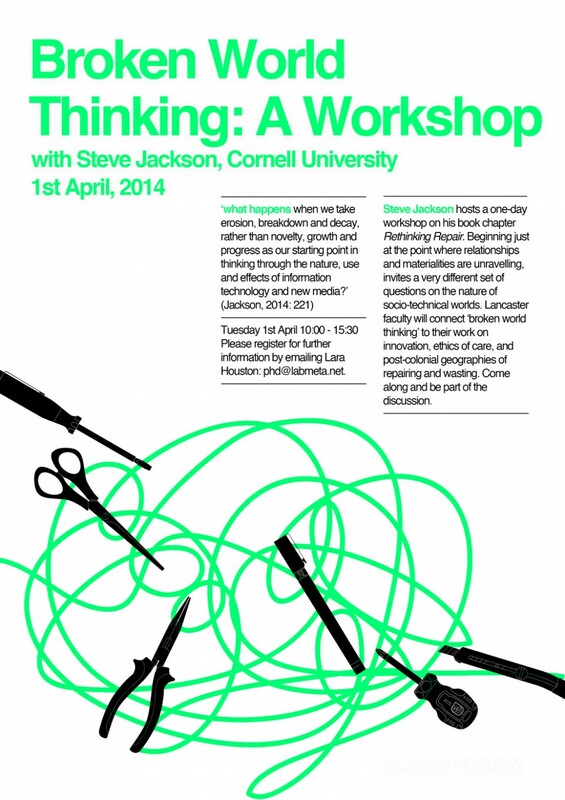 In this one day workshop hosted by Steven J. Jackson, Lancaster faculty and students discussed their work using the generative kernel ‘broken world thinking’.